Teach dog to read? Can it be done? Yes, it can. You can teach dog to read. Well, even though Fido is never going to read a book or magazine, his ability to understand a written word as a command can come in handy. 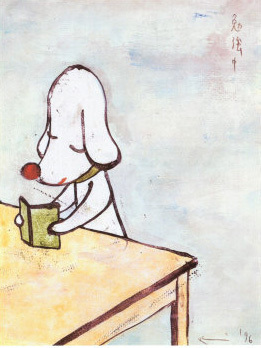 The teach dog to read techniques can help you with special situations. Life has a tendency to throw curve balls. There may come a day when you have difficulty speaking. Maybe you just have laryngitis, and you can’t call your dog. Or maybe you have a more serious condition. More likely, your dog may lose his or her hearing someday. At 14 years old, my dog has lost most of hers. I now use hand signals to communicate with her, but I’m working on teaching her to read too. 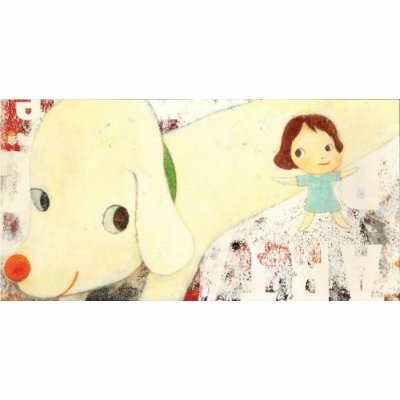 In his first book for children, renowned artist Yoshitomo Nara tells the charming story of a puppy so large that no one notices him-until a determined little girl climbs high enough to meet him and become his friend. 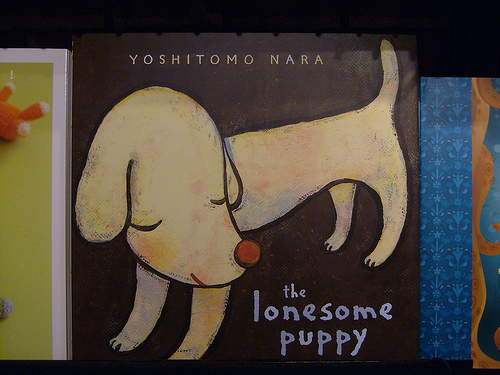 A sweet tale from an artist for whom childhood holds a magical appeal, The Lonesome Puppy is sure to delight young readers and Nara fans of all ages.